Something all Austinites can be proud of: our city is a premiere vacation destination with 30,000 hotel rooms accommodating 19.7 million visitors each year. So why settle for a big box hotel when you can stay at some of the city’s coolest boutique hotels in Austin? 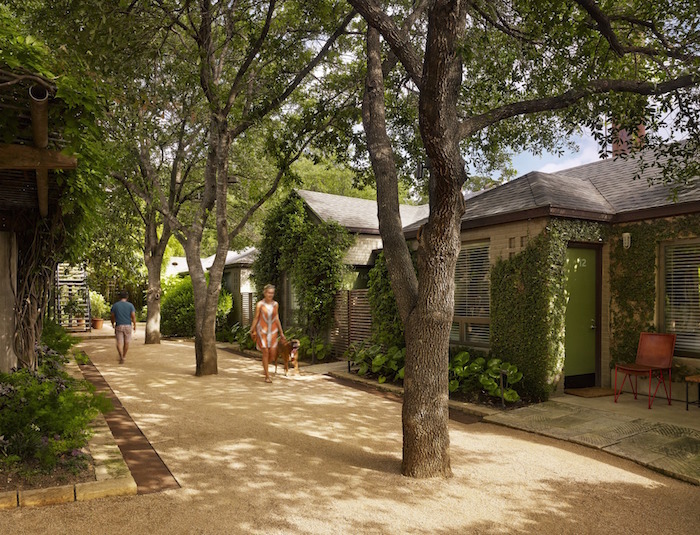 These hotels are located in prime locations around town and offer guests a unique opportunity to experience Austin. And you don’t have to be visiting from out of town to enjoy them. Staycation, anyone? Stay Here Because: Austin Motel has held on to that “Old Austin” feel by sticking it out through the good times and the bad. The rooms are comfortable, affordable, and right in the middle of the hustle and bustle of South Congress. While you may imagine boutique hotels to all represent modern design and ambient music, what they really represent is an independent spirit in a unique setting. 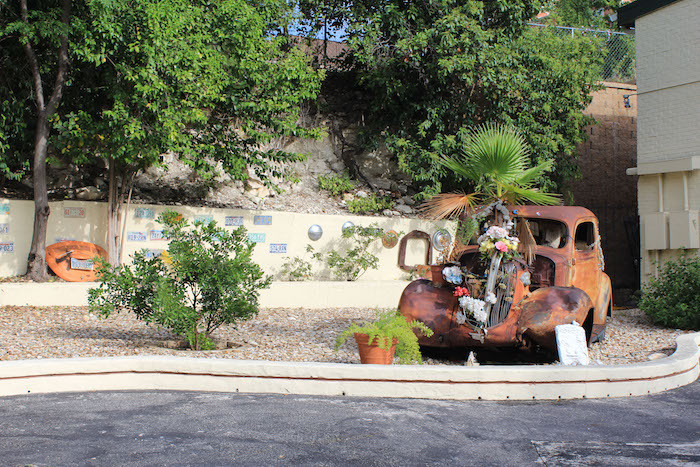 Austin Motel definitely represents the Austin spirit of laid back friendliness and, because of its affordability, makes the perfect staycation spot. Things to Do Nearby: At Austin Motel, you’re right in the middle of all the action in SoCo. Head over to Amy’s Ice Creams nearby. If you’re looking to add shopping to your trip, there are plenty of boutiques nearby, but be sure to visit Parts and Labour for Texas-made crafts including t-shirts and posters. Stay Here Because: This bed and breakfast is at the top of its class in the city. 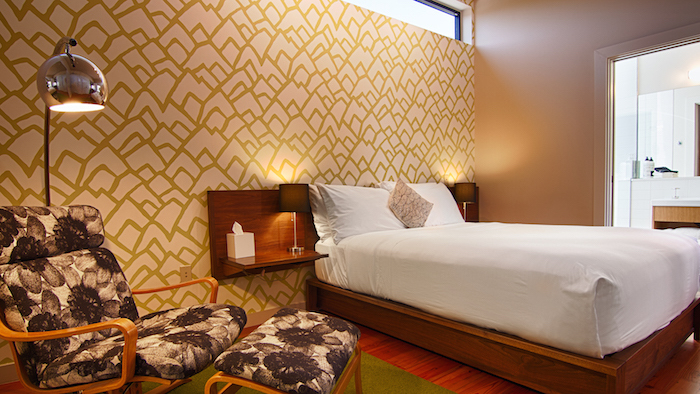 Tucked away in Travis Heights, you can enjoy your breakfast while you stay in a beautifully designed room. The five rooms vary in size and can accommodate 2-4 people. Check out the Live Oak Suite, where an attached library serves as a tranquil setting for reading, yoga or just enjoying someone’s company. Things to Do Nearby: Get in your car, hop on your bike or tighten your sneaks and head over to Whip In for craft beer, wine on tap and delicious Indian food. Take in the sights as you make your way to your well earned Dal by avoiding I-35 and using neighborhood streets. The boardwalk, downtown and South Congress are also within reach, as are East Austin’s amazing bars and restaurants. Stay Here Because: Gateway Guesthouse features grand open spaces, landscaped gardens with a pool and in-ground spa and professionally designed accommodations. Enjoy daily breakfast prepared by Chef/Owner Bess Giannakakis or join a small group, hands on cooking class led by her. No matter what you do, the friendly and welcoming staff will make you feel like you’re home away from home. Things to Do Nearby: Gateway Guesthouse is very close to the boardwalk on the Butler Hike and Bike Trail. From there, you can take a scenic walk along the water to downtown and the bat bridge, or head east and follow the trail across the river to Rainey Street for Detroit-style pizza at Via 313 and a cold Texas craft beer from Craft Pride. Stay Here Because: From locally roasted coffee beans to furnishings and furniture designed by locals, Heywood Hotel aims to represent the creativity and beauty of Austin. This updated Craftsman bungalow features skylights, tall ceilings and a beautiful patio. The hotel offers a locally roasted “Heywood Blend” coffee, free bikes and exquisite rooms. 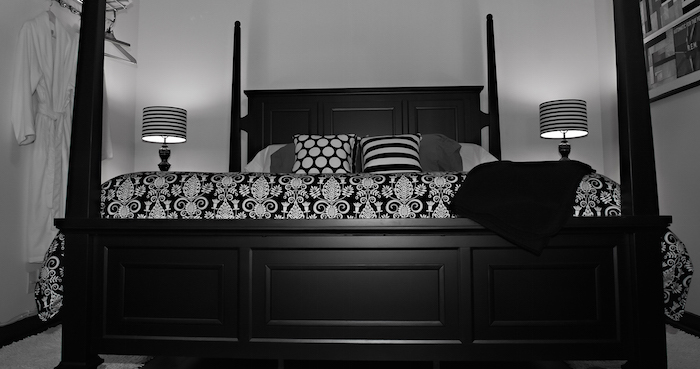 Heywood is the perfect location for a romantic weekend getaway/staycation or special occasion. Things to Do Nearby: At Heywood, you’re less than a block from one of the best breakfast tacos you can find. The Veracruz All-Natural food truck serves up tasty Migas tacos. Order them on corn with a watermelon Agua Fresca. Or check out La Barbecue just down the road. It’s also a 4 minute drive or 20 minute walk to Austin Sailboat Rentals where you can rent a kayak on the quieter side of Ladybird Lake. Stay Here Because: In case you didn’t know, Saint Cecilia is the patron saint of music. So it’s fitting that in the live music capital of the world, Hotel Saint Cecilia offers a retro, glamorous rock-n-roll exclusive retreat. Saint Cecilia’s 14 unique accommodations feature a collection of antiques, modern furniture and original artwork with stunning outdoor lounge spaces. 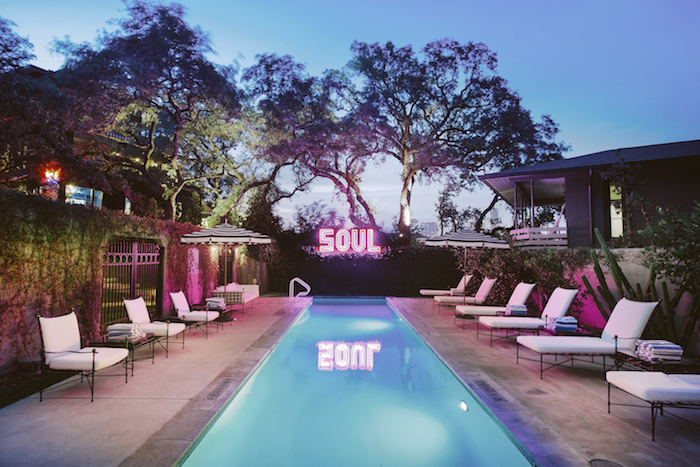 Don’t miss their heated “SOUL” pool with a side of Austin Beerworks Pearl Snap Pilsner. Things to Do Nearby: You’re very close to some great Italian food at Botticelli’s. Their happy hour is a steal in their beer garden and be sure to order some Botticelli Bread. The neighborhood surrounding Hotel Saint Cecilia is the perfect setting for evening walks…to Amy’s Ice Cream again. Stay Here Because: Hotel San Jose offers a courtyard lounge, pool and lobby bar with a great happy hour, all within a peaceful setting. This bungalow-style hotel is surrounded by lush gardens and houses gorgeous rooms. Take advantage of the Texas resident special for June: book a midweek stay and receive 25% off your room, a bucket of Shiner Bocks and a $10 gift certificate to Jo’s Coffee. You must show your Texas ID at check-in so no funny business, Wisconsinites! Things to Do Nearby: You are literally steps away from the iconic “I Love You Sign” at Jo’s Coffee Shop. Go there for the Instagram photo op, but stay for a cup of coffee at Jo’s and a breakfast taco. Across the street, you’ll find Home Slice Pizza, arguably some of the best pie in town. Afterwards, get some putt putt in at Peter Pan Mini-Golf. You can end your night with a nice dinner at South Congress Cafe. Ordering Shiner Bock all afternoon by the pool is also perfectly acceptable. From personal experience, I know you get to see Austin in a different light when you staycation. Unseen details suddenly become apparent and you rediscover this wonderful city with fresh eyes. So why not do it this summer and stay at one of these awesome boutique hotels? For those thinking about visiting Austin, spend the extra couple of dollars and treat yourself to a unique experience at one of these locations to see and experience the easygoing and beautiful side of Austin. 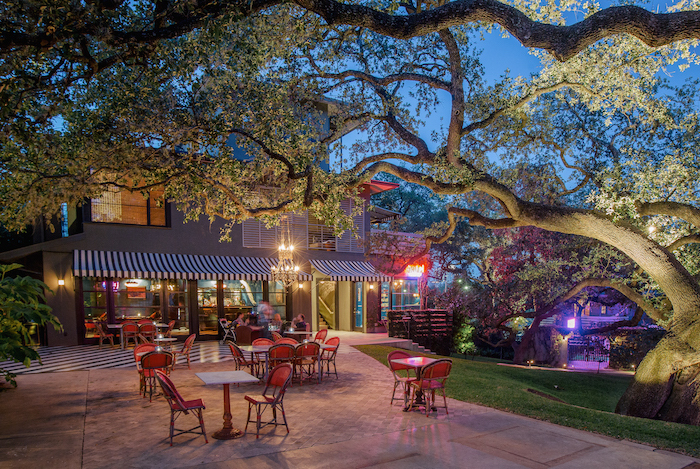 Have you stayed at any of these boutique hotels in Austin?